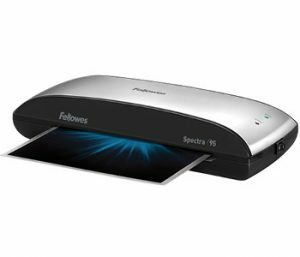 Through our wholesale distribution partnerships, we are able to offer the full line up of Fellowes laminators and supplies as well as a select lineup of GBC professional grade roll laminators. Today’s laminators are compact, cost effective, and easy to use. There are many to choose from, depending on the thickness of the laminating pouches or rolls, the size of paper you need to laminate, and the frequency of use. The Fellowes website has this handy guide to help you choose the best model for you. You can also contact us for help with selecting the best model and for pricing. 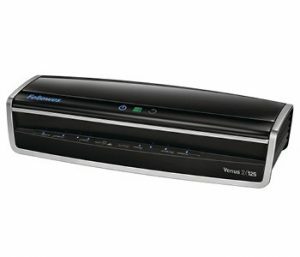 User-friendly laminator for light home, home office, or small office use. The Spectra has a 9-1/2″ entry width which accommodates multiple document sizes. Ready in 4 minutes, it laminates documents and photos up to 5mil (pouch thickness). The Auto Shut off prevents overheating when not in use. The new Saturn 3i 95 model has a rapid 1-minute warm-up with InstaHeat Technology that get you going right away. Hot lamination for 3-mil or 5-mil and cold setting for self-adhesive pouches. The Pouch Tracking System detects and alerts the user if there is a mis-feed. 9-1/2″ entry width accommodates multiple document sizes, and the Auto Shut off save energy and prevents overheating. The Saturn 3i 125 model has the same great features as the Saturn 3i 95 model, but with a wide 12.5″ opening for laminating larger documents and photos. It also has a rapid 1-minute warm-up with InstaHeat Technology that get you going right away. 12.5″ entry width accommodates multiple document sizes, and the Auto Shut off save energy and prevents overheating. The Jupiter 2 125 is an essential pouch laminator for the office. The Fellowes unique AutoSense system detects pouch thickness and self-adjusts to the optimal laminating setting. InstaHeat technology provides a fast 1 minute warm up time. The Jupiter 2 now has faster performance to get through up to 47” per minute, and the advanced Pouch Tracking System detects and reverses pouch in case of mis-feeds. Laminates hot pouches up to 10 mil thick; as well as cold pouches. The auto shut-off prevents overheating when not in use. A robust 6-roller system ensures superior lamination quality. 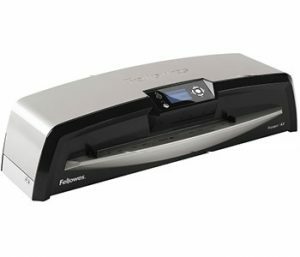 The Venus 2 125 pouch laminator is perfect for heavy use in busy offices. The Fellowes unique AutoSense system detects pouch thickness and self-adjusts to the optimal laminating setting. InstaHeat technology provides a fast 30-60 second warm up time. The Saturn 2 now has faster performance to get through up to 53” per minute, and the advanced Pouch Tracking System detects and reverses pouch in case of mis-feeds, and the Feed IQ feature lets you know when to load the next pouch to get through large jobs as quickly as possible. 12.5″ wide feeding slot allows for lamination of large documents and photos. Laminates hot pouches up to 10 mil thick; as well as cold pouches. The auto shut-off prevents overheating when not in use. A robust 6-roller system ensures superior lamination quality. The Voyager 125 pouch laminator has an exclusive AutoLam™ Technology that self-adjusts to optimal laminating setting for the pouch and document you use. A 4-roller system provides superior results on documents up to 10 mil thick. The advanced belt drive transport system guides document through the laminator for efficient, jam-free performance, and the control panel makes laminating easy and trouble-free. HeatGuard™ Technology keeps heat inside so laminator is comfortable to touch. It heats up in just four minutes, and laminates in just over 30 seconds. The green light and audible beep indicate when machine is ready, and the Auto Reverse mode reverses document flow for easy removal. 12.5″ wide feeding slot for large document and photo lamintaing. 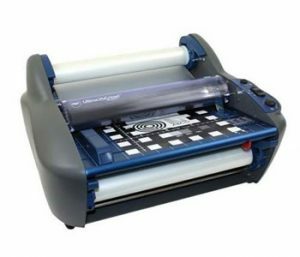 The GBC Ultima 35 roll laminator is perfect for schools, arts & crafts workshops and community centres where you need to laminate odd shapes, long banners and large documents. 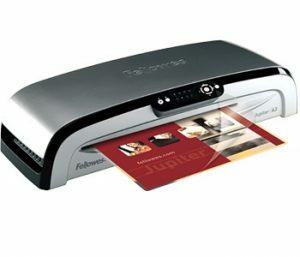 It laminates items up to 12″ wide, has a fast 1-minute warm-up time, and a fixed speed, 36″ per minute. The reverse motor function makes it easy to clear jams and documents. Other features include an integrated trimmer and auto shutoff. Compatible with 1.7 to 5 mil EZLoad™ film; starter supply of film is included. Comes with a 2-year manufacturer’s limited warranty. 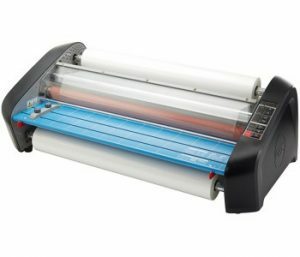 Thermal roll laminator with EZload simplifies film loading and provides quick and easy laminating. 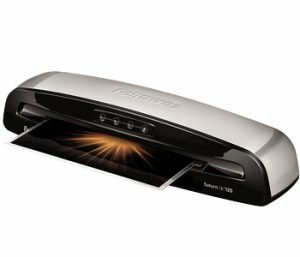 Warms up in just 6-9 minutes to laminate items up to 27″ wide with NAP I or II film up to 3 mil thick. Built-in horizontal trimmer helps you turn out clean and polished lamination every time and the control panel includes a handy footage counter.